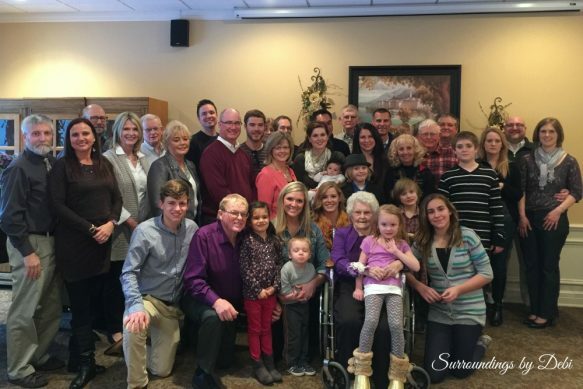 My dear, sweet grandma was turning 100 I wanted this to be an extra special day for her. 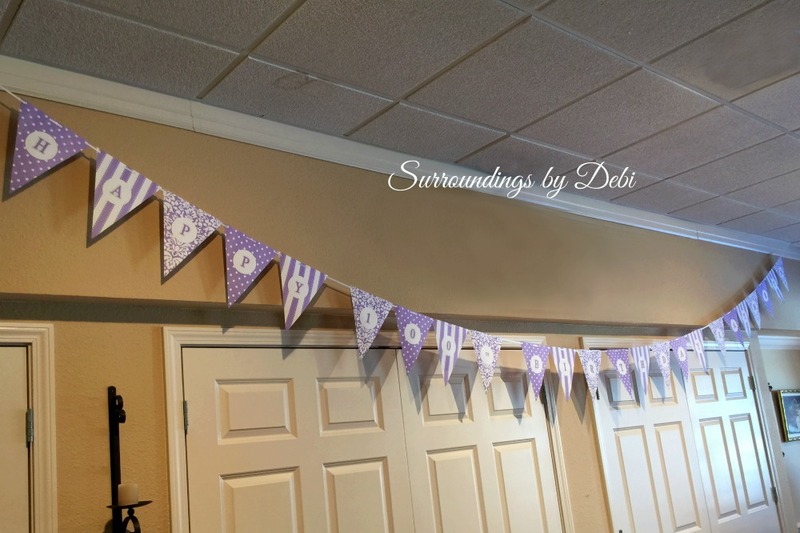 I am sharing with you today our 100th birthday party ideas, the steps we took creating this special day, and a few quick peeks of the celebration. Start by choosing a theme for your 100th birthday party. Do they like to golf? Play cards? Read? Travel? Are they a music lover? Do they have a favorite color? Any of these can give you a great start to choosing the theme of your party. Anyone who knows my grandmother knows she loves the color lavender and that made it an easy choice for us. Where will you hold it? Next choose a venue for your party keeping in mind the guests who will be attending and the guest of honor. A venue with easy access and free of stairs would be needed for our event. We chose the “community room” at the retirement home where grandma lives. A perfect choice, as many of the guests who would be attending lived in the home. Decide on your invitations using the theme you have chosen. You can buy a ready-made invitation or create your own. There are hundreds of possibilities available. 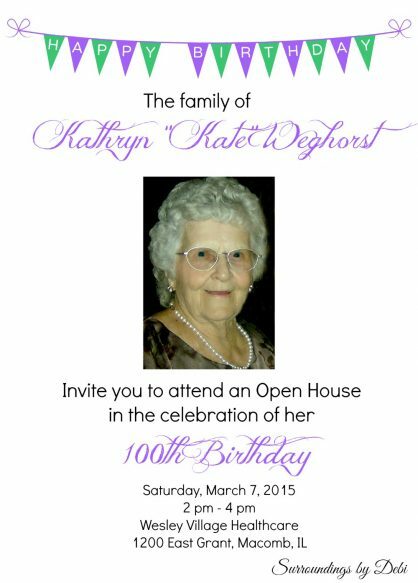 For grandma’s party, we created simple invitations using PicMonkey. 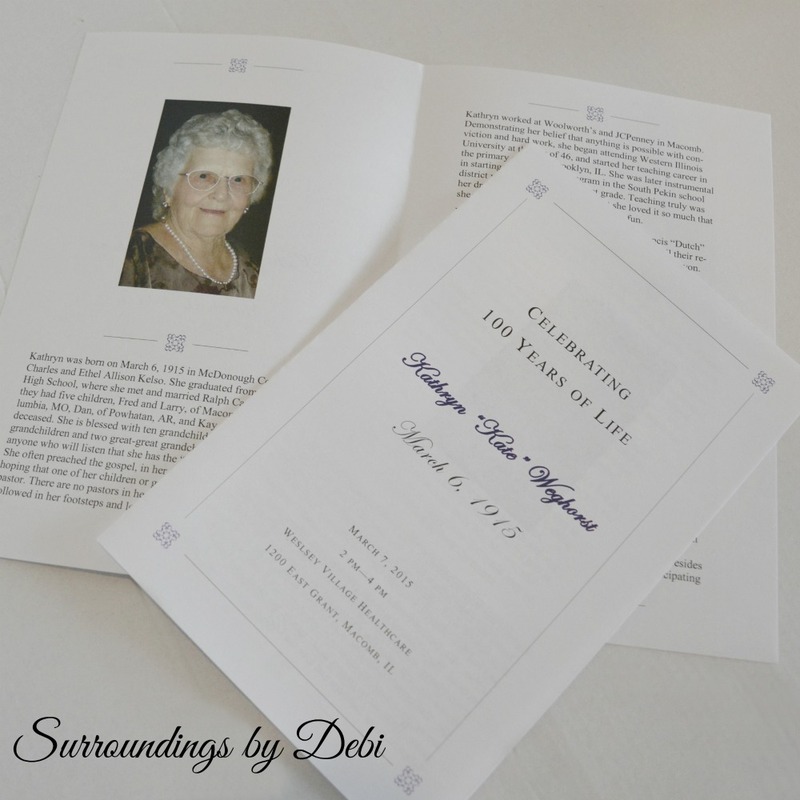 We personalized the invitation using a photo of Grandma . Publicize the special day to others. An open invitation to friends or an announcement of the special occasion can be inserted into the local paper. Send in an announcement to the Today Show. Get a special acknowledgement from the President. Find out how HERE. 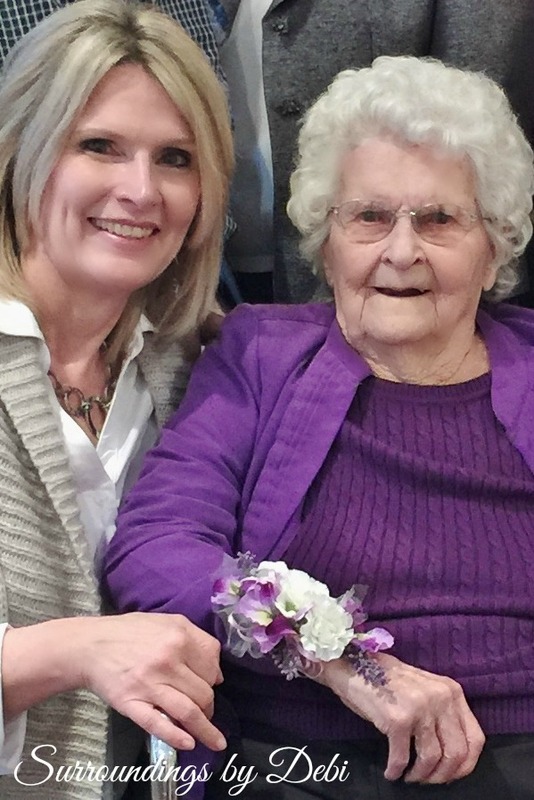 Grandma was honored to receive special recognition from the House of Representatives in her home state of Illinois. 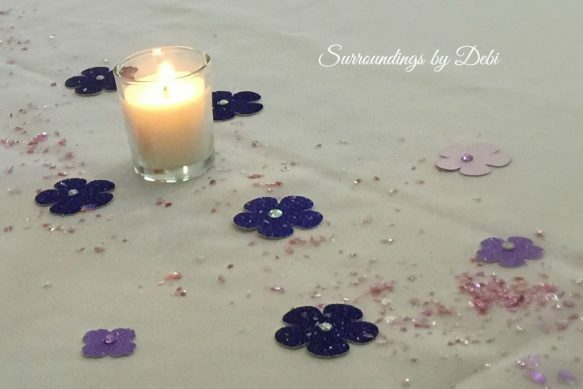 Create table decorations using the theme of your party. 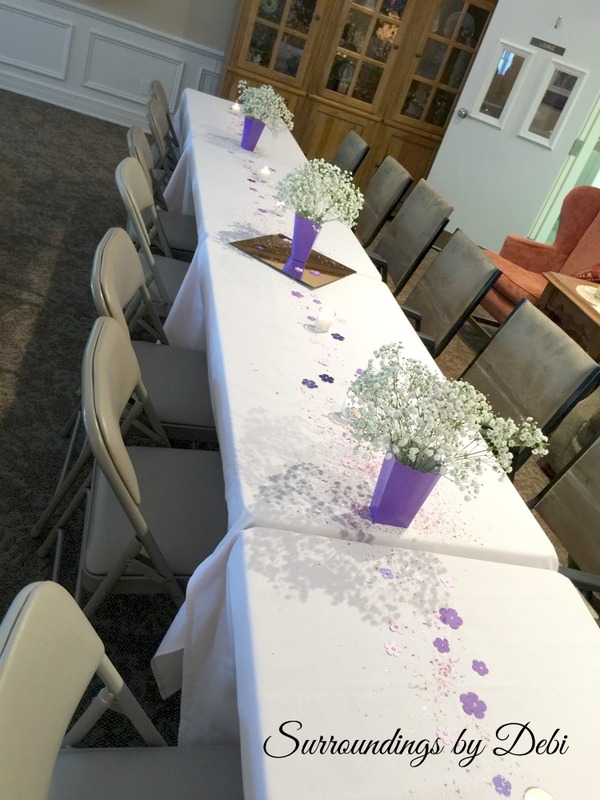 Simple table decorations were fashioned using fresh baby’s breath and inexpensive pop up boxes in our chosen color from Party City. A small plastic disposable cup was filled with water, placed into the box and the stems of baby’s breath were simply inserted into the created container. This is an easy arrangement – with a lot of impact. Confetti to coordinate with your theme enhances your table décor. Our confetti was created using a Cricut machine. Simple flowers were cut out of scrap-book paper and each flower was centered with a rhinestone. These were super simple to make and added so much to the tables. Simple votive candles added a warm touch. Room decorations can then be added. A simple banner was easily made using a kit found at Party City. Create handouts for the guests attending. 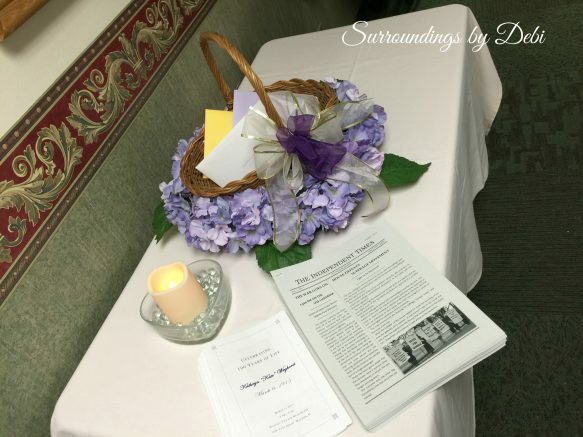 Information on the guest of honor’s life can be included. A picture inserted would make a special keepsake for guests and family members. We included a brief synopsis of our grandmother’s life. An “events of the birth year” is another added touch and so much fun as it gives facts about the year the honoree was born. Ours was created using Microsoft Publisher. We simply inserted information from the year she was born into our publication. Be sure to have a place for those attending to put the congratulatory cards they bring for the honored guest. A decorated basket or similar container is perfect for this. Display photos of the honored guest. There are so many ways you can do this. 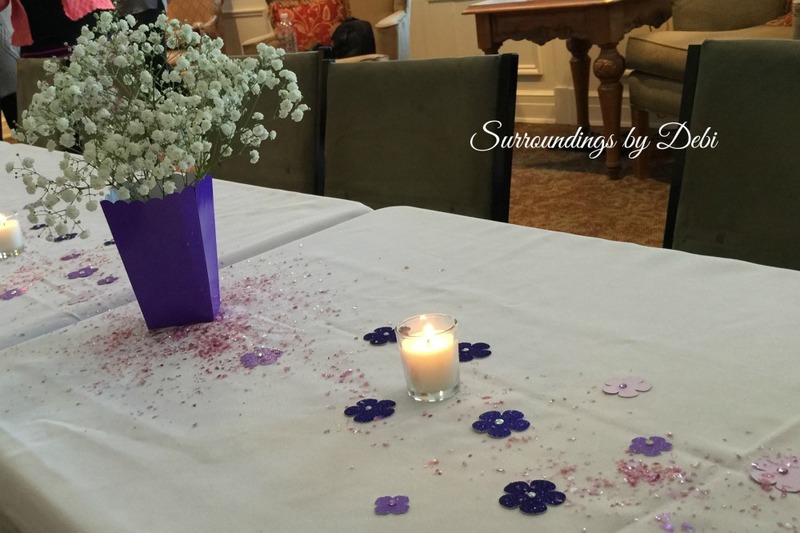 Photos can be placed on the tables as centerpieces, posters can be created using photos throughout the years, memory books can be made using photos, and much more. A video can easily be created with photos and music using Movie Maker or a similar program. Even a novice like me was able to create a fun memory video which played throughout the day. Observing my grandmother’s face light up as she watched the video made it all worthwhile. If you will be serving food, now is the time to begin planning what you will have. We chose to have only cake and punch for our afternoon event. Visit your local bakery and choose a cake with a 100th birthday design using your chosen theme or create one yourself. Consider a marble cake or one that has a combination of chocolate on one side and white on the other. 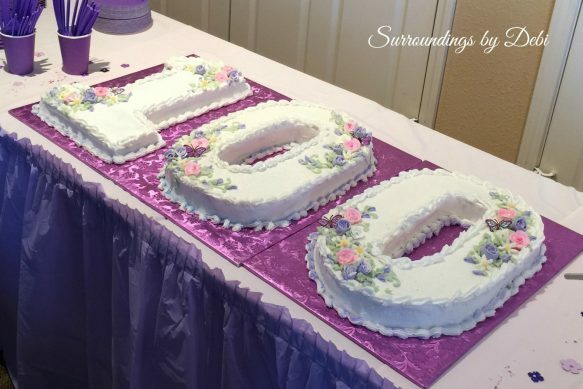 We were lucky enough to have a family member who created a beautiful 100th birthday cake. Let’s add a bit of music! Have the birthday song ready to play so everyone can join in singing a rendition of Happy Birthday to the honored guest. A piano was available in our venue and a family member was prepared to play the song as we sang along. Play music throughout the event in the background. Using favorite songs of the honored guest or songs from a favorite era creates a special touch. We were able to add these to our video as it played throughout the day. Honor a life well lived. Allow time for family members and friends to offer up tributes to the honored guest. Special memories and stories shared make the event one for everyone to remember. Be sure to have a camera on hand and someone dedicated to take photos to record the memorable day. This ensures the day will be recorded and treasured for years and generations to come. 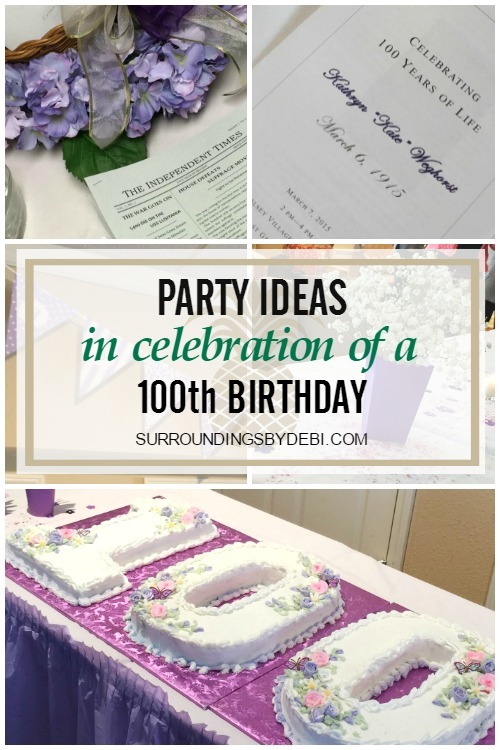 I hope these 100th birthday party ideas inspire you to create special memories for your next event – whether it is a 100th birthday or any special occasion. Here’s to celebrations of any kind – after all isn’t each day a celebration of life! 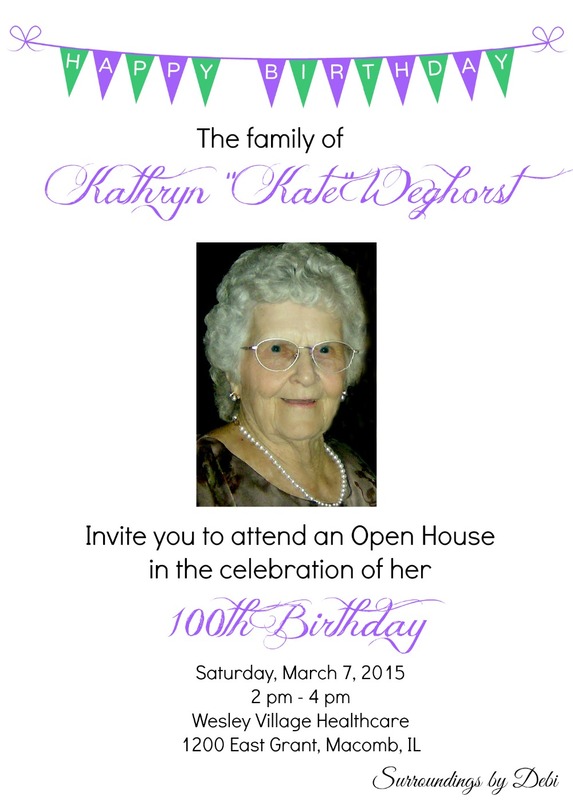 My mother will be 100 years young in October, but we are planning her big party in July to accommodate travelers. So there will be two parties. I needed more ideas and think that I can adapt some of your memory lane ideas. Thanks for the info about the White House card. We are going to make centerpieces with dinosaurs and balloons. The flower arrangement will use her fold-open sewing basket with hobby items inserted. where did you get “the independent times”? did you make that or find it online? Thank you so much for the wonderful ideas. That cake is great. Great ideas! 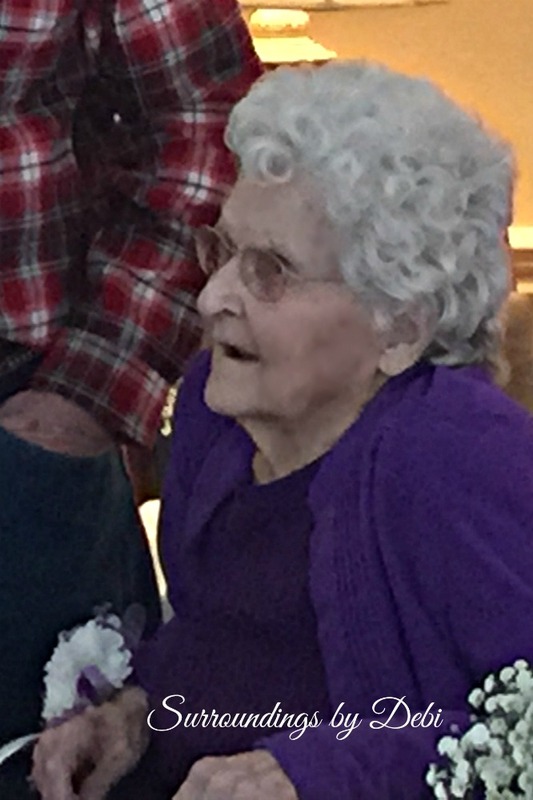 My mom’s 100th birthday is June 26. We are planning a party at her nursing home inviting family as well as staff and other residents. We have ordered Sprecher Root Beer with special labeling including mom’s picture. We plan to serve root beer floats and Elvis will make an appearance. I really like your 100 birthday cake–how was that made? I’m not that talented. 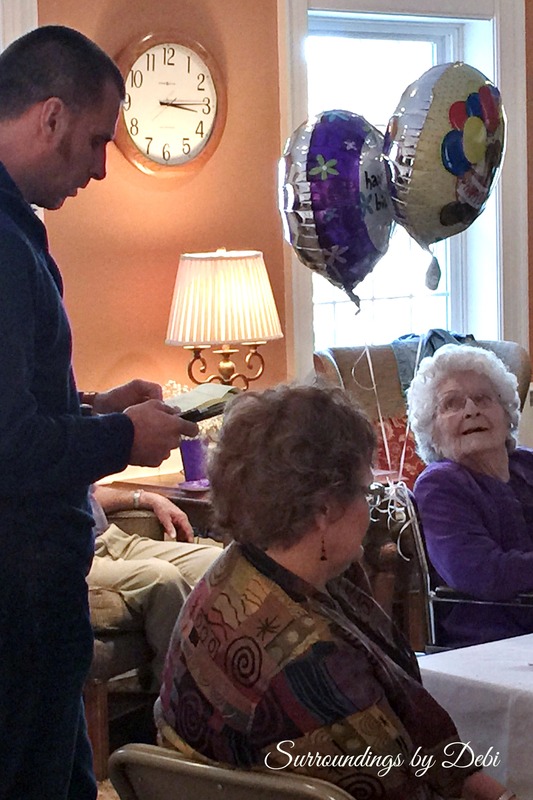 I am in the process of planning my mom’s 100th birthday party for May, 2016. Your page has been so much help. Thank you. If you have information on how to find facts about life 100 years ago, I would appreciate hearing from you. Again thank you so much. Sue – We just searched online for “What happened in (the year you are looking for) and found items of interest. We then created a document in “publisher” and inserted the facts and happenings we wanted to use. I hope this helps. If you have other questions please let me know. Thanks for stopping by and good luck with your party. Thank you so much for sharing. My grandma will turn 100 in April and we will have a party at her church. I want it to be nice and classy which yours was. I will definitely use your ideas. What a beautiful celebration. My Mom is turning 100, April 13, 2016. I LOVE… LOVE… LOVE the cake! I live in Illinois, near Chicago, and have been looking for a bakery that could create a cake like this. Unfortunately, I haven’t found one. 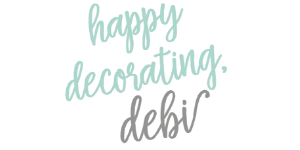 Debi, your family member wouldn’t be interested in baking another beautiful creation now, would she/he? LOL! I am planning a 100th birthday party for my grandfather. I want it to be very special. Thank you for all the lovely ideas. I too am planning a 100th party for my mom and would be interested in the Independent times “Year In Review”. Could you please let me know how I could obtain a copy? Thank you. Is there anyway I could get a copy of your Independant Times “Year in Review?” I am planning a 100th party for my mother in mid-November. Did you make this up on your own or buy it? You are so fortunate it still have your grandma! Thanks for sharing part of her special day. This is just beautiful. It brought tears to my eyes. 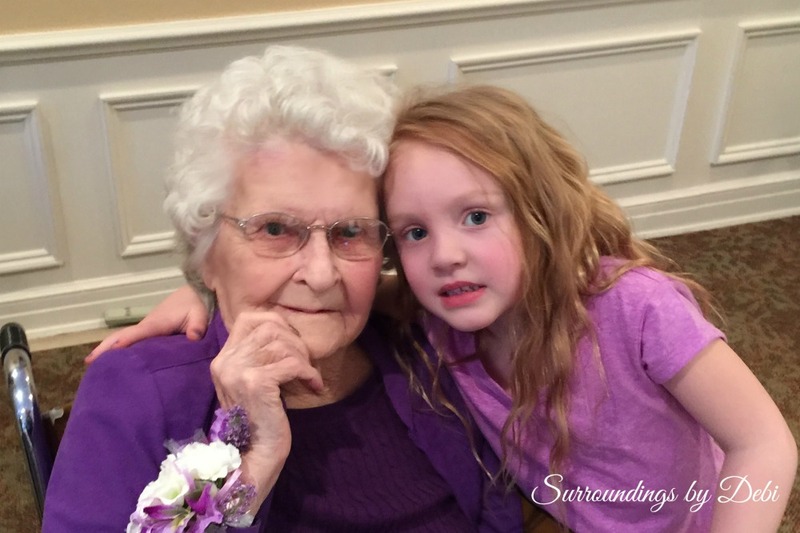 Best wishes to your sweet Grandmother for a year of joy and blessings. Absolutely wonderful! Beautiful decorations with many beautiful smiles to make more memories for everyone. Many wishes for more years of blessings for your dear grandma !